Fandango: A foolish or useless act or thing. 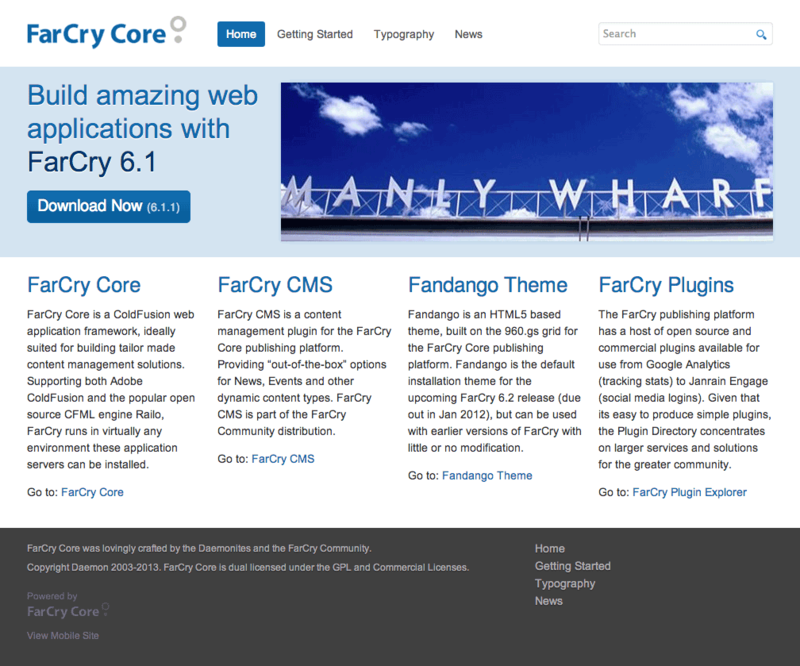 The Fandango (v6.2.x) release of FarCry Core for ColdFusion shipped with a brand new HTML5 design by the same name. This design replaced the original Mollio design as the default theme to ship with the FarCry installer. Released under the GPL and FarCry Commercial License, Fandango can be forked/cloned from our GitHub repo. Or seen online at the Fandango project site. While you can always get the fully integrated FarCry template skeleton as part of the installer, we find it useful to maintain a reference site in pure HTML/CSS. Plus its an opportunity for non-FarCry users to do something with the design if they desire. Lovingly crafted by Daemonite Justin Carter (@justincarter) for the FarCry community.